The Mising Autonomous Council, Gogamukh requires a Contractual Staff for the post of Personal Assistant attached to Chief Executive Councillor for the works of Drafting, Preparation of Project Reports, maintaining of Office records, files, monitoring of livelihood projects, Supporting of all other relevant works pertaining to the council. Educational Qualification: Minimum Graduate with computer back ground preferably good in English and Assamese language with good communication skill. a) Expert in preparation of Project report drafting on various works. b) Previous working experience in Central/ State Govt./ NGOs/CBOs on various development sectors. c) Willing to work in rural area. Remuneration: Starting fixed salary @ Rs. 20,000.00 per month. 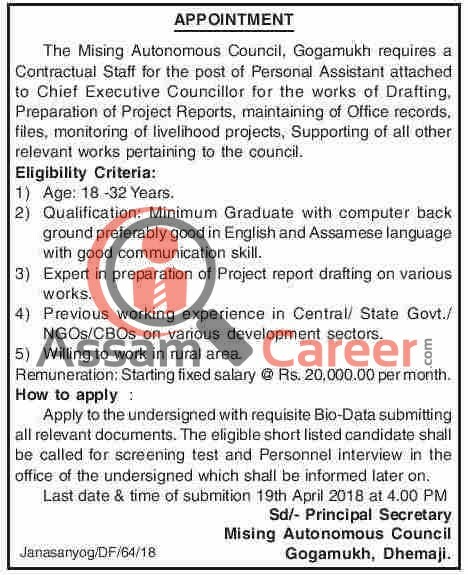 How to apply : Apply to the Principal Secretary, Mising Autonomous Council, Gogamukh, Dhemaji with requisite Bio-Data submitting all relevant documents. The eligible short listed candidate shall be called for screening test and Personnel interview in the office of the Principal Secretary, Mising Autonomous Council which shall be informed later on.